Ice Cream Smiles Friday, Snow Cream Anyone? As the snow starts falling across most of Minnesota, once again, take a break this Friday to enjoy some ice cream or maybe make your own Snow Cream? 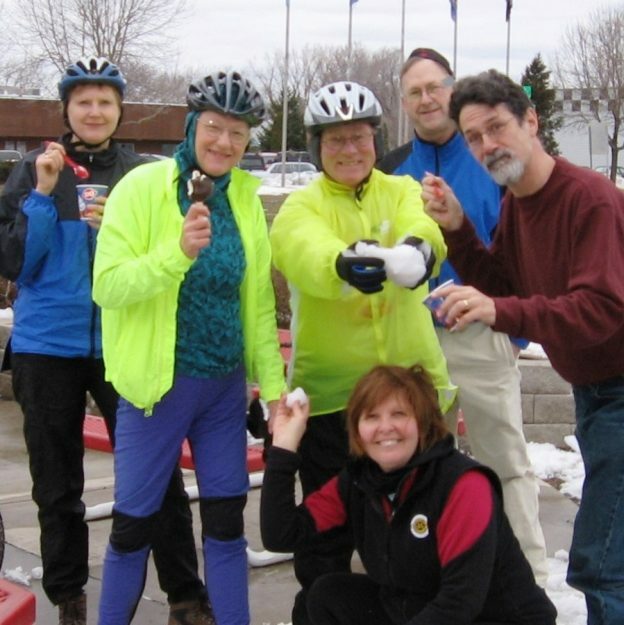 This photo was supplied to us by the Hiawatha Bicycling Club, from a past December ride held up in the Twin Cities Gateway Area of Minnesota. With the snow on the ground, we hope you get out on your fat bike, X-C skies, snowshoes, etc. and enjoy all the winter’s active outdoor possibilities. See many more bike friendly places to explore in the new Minnesota Bike/Hike Guide. This entry was posted in News and tagged #dq, #icecream, #icecreamofinsta, #icecreamofinstagram, #icecreamsmiles, #icecreamsmilesfriday, #onlyinMN, #yum, #yummy, Bike Guide Minnesota, Bike Guide MN, free bike maps, ice cream, Minnesota, Minnesota Bike Guide, MN Bike Guide, Twin Cities Gateway on December 16, 2016 by Stephanie Hunt.